CAMDEN, NJ — The Cooper Foundation, along with city officials and school leaders, today distributed backpacks and school supplies to student scholars from KIPP Cooper Norcross Academy Lanning Square and John Greenleaf Whittier schools. KIPP Cooper Norcross Academy is New Jersey’s first renaissance school, and serves students in grades Pre-K through 8th living in Camden’s Lanning Square, Cooper Plaza, and Bergen Square neighborhoods. The Foundation collected more than 1,000 backpacks filled with school supplies during its Operation Backpack Drive this summer. 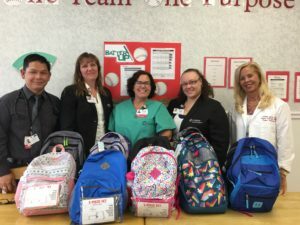 The backpacks and supplies were donated by Cooper University Health Care employees. As a result, every child in the school received a backpack with all the necessary supplies for a successful start to the school year. The Cooper Foundation was joined by several city and school officials for the Operation Backpack distribution, including: Camden City Council President Frank Moran; Camden City Councilwoman Dana Burley; Camden City Councilman Angel Fuentes; Camden City School Board President Martha Wilson; and Camden City School Board member Dorothy Burley.